The main winners at the National Conference League's presentation night at Bradford's Cedar Court Hotel. Picture: Matthew Merrick. CASTLEFORD and Featherstone Rugby League Referees Society’s Joe Stearne was an award winner at the annual Kingstone Press National Conference League presentation at Bradford’s Cedar Court Hotel. 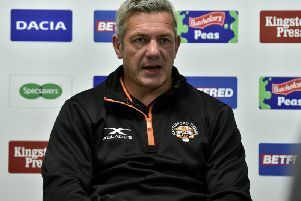 Former Castleford High School pupil Stearne won the league’s referee of the year accolade after being one of three officials nominated. Stearne was in charge of the league’s recent Premier Division Grand Final between Thatto Heath Crusaders and Siddal that Thatto won 16-12. The presentation night, which included a three-course meal, was attended by delegates, players and staff from all the league’s clubs. Ex-Great Britain player Leon Pryce was guest speaker and Mike Bennett was MC. Crosfields won the match programme of the year award. Underbank were second and Stanningley third. The season’s fair play award was shared by Gateshead Storm and Kells. Stanley Rangers’ Barbara Rawlinson won the secretary of the year award. The top try scorer award went to Dominic Flanagan (Oulton Raiders) who scored 39 tries. West Bowling’s Harry Williams was top points scorer with 294. The coach of the year award winners were: Premier Division: Richard Owen (Thatto Heath). Division One: Martin Rowse, Paul McShane and Sam Thorpe (Hunslet Club Parkside). Division Two: Steve Gill (Oulton Raiders). Division Three: Glenn Barraclough (West Bowling). The evening concluded with a question and answer session with former Bradford Bulls and St Helens player Pryce.